Twenty years on from the hugely successfull, hilariously funny Dumb and Dumber, Harry and Lloyd return for a brand new adventure. Lloyd finds out he has a daughter and the duo go on a road trip to find her. I was looking forward to seeing this so much as I was a huge fan of the original but I really felt Dumb and Dumber To was missing a lot. I felt more could have been done with the plot and the Farrelly Brothers just regurgitated a lot of the best gags from the original movie but just slightly changed them up to suit the new storyline. 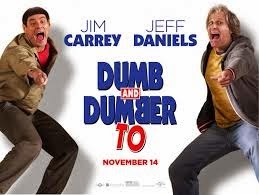 While Daniels and Carey were very comfortable back in the roles of Harry and Lloyd after such a long break, it felt like Daniels was not quite as enthusiastic as Carey who made Lloyd denser and louder than before. Rachel Melvin who played Fanny Felcher did a fantastic job of showing the audience what the female version of Harry and Lloyd would be like and delivered some really funny scenes. All in all not the worst movie of the year but not the greatest either. I think I expected too much from this sequel which turned out to be just lukewarm for me.